Wood blinds are the classic choice for adding the warmth and beauty of wood to any room of the home or office… Available in 2’’ and 2 ½’’ slat sizes 3 ¼ & 3 ½ ‘’ decorative valance. Comprehensive palette of fourteen colors. Traditional routed slats with braided ladders, Durable 2*2 color-coordinated steel head rail, Trapezoid bottom rail, Premium cord tilt with color-coordinated cord and tassels. Upgrade options include motorization, fashion tape, etc. 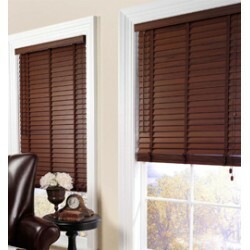 Wooden blinds are made from natural, furniture-quality hardwoods, like basswood and American hardwoo.. The most luxurious of all our window treatments, custom wood blinds add unparalleled warmth and clas..